I have finally added M.Small to the collection of handwriting lesson generator templates. This set has a letter size of around 9mm. The set features 2 blank tops, full, and 2-lesson templates. Near the bottom of the gift tag page, I have added three more printable sheets of ready to print Christmas gift tags. Each one has a theme and they are - Tags #4 Birth of Christ, Tags #5 Santa, and Tags #6 Holly. Each sheet has 10 different tags. This is as much seeing the value range of your drawing pens and pencils as it is an exercise toward achieving just the right shading in your drawings. This page is updated with new images and two new files that are challenging. I needed a new one of these files, so I made one. With the printout, you can record the login info for your favorite URL's or just the important ones. The 2014 Half-Size Dated Block Planner is online and ready to print. Like all of my half-size files, the finished pages are designed for binders that use 5.5" x 8.5" paper. I hope that you like it. I present to you a tool - "Comic Strip Layouts with a Story Line Generator". Not generator as in random words magically appear, but generator as in - You type something and your words appear on the comic strip template in a "comic strip font". 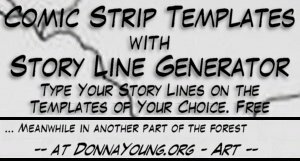 New Set of Templates - "Arch Top" a set of printable comic strip templates that feature an open top for the comic title, a dramatic opening, or something else. The panels on the "Arch Top" comic strip templates vary. Guide Words Printable Lessons offers to print cards and other printable items that can be used for the guide words lessons. The guide word lessons include instructions for both beginning and advanced. I reformatted the Ten Subject Grade Form and added a white and yellow version of the form. At the single subject grade form, I linked the alpha keyed form, noted the Roman keyed form, and added links to Roman Keyed planners. Weather - a section in our Nature Journal - The weather page is updated with more information and two printable files for the half sized binder. The TOC planner is not lesson plans, it is a series of pages that are designed to help you plan Exploring Creation with Chemistry and Physics from Apologia's Young Explorer Series. 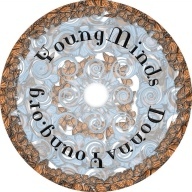 This is a new form style at donnayoung.org. The design is "clean" (uncluttered) and the layout utilizes the margins by extending the row lines. I made another version of the Blue Calendar today. The blue is lighter, the lines are finer, the row with the days is light gray, and I used the font Garamond. Household- Half-sized - Paper - This page has filler paper for half-sized binders. I have updated this page, test printed all of the files, and added a few new files. About Keys and One newly Alpha-Keyed single subject grader pdf file and one newly Alpha-Keyed XLS Gradebook. 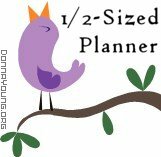 Requested - Basic Check Register for the 1/2-sized planner, sometimes called personal sized, and the requester called it junior sized. There are two files - One prints a pair of vertical registers and a second file prints a horizontal register. An article describing how to use the worksheet GS-QP in V Planner V3. GS-QP refers to Grade Scale and Quality Points and it is the sheet where the grade scales are made. V Planner Video: Which V Planner am I Using? Applies to V Planner V3. A new feature in V3 that allows you to either set a system (Date or Number) per planner or set a system (Date or Number) per subject. Requested - The diploma pictured here, but without the border. It is a typeable PDF. See what was new during 2012 at donnayoung.org.